Yesterday we saw the AIGCP (Association des Groupes Cyclists Professionels) has no confidence in the UCI leadership. AIGCP held a meeting in Paris on Friday, voting on different key subjects. The AIGCP is taking care of the pro teams interests and it not a small thing they are coming out like this in public. Now, many would say that this is nothing new and it is not getting us anywhere since the UCI don't care what the teams think anyway. I beg to differ. This is a new twist to the ongoing "battle" between pro teams and the UCI. The AIGCP is an organisation which depends highly on who's leading it. 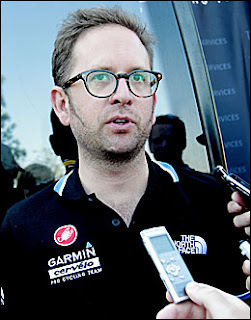 Jonathan Vaughters is currently the president of the AIGCP and has been in fights with the UCI over several issues the last years. Remember the radio ban? I see this as a two-fold battle. Firstly it is about power. The AIGCP stated in a release to cyclingnews that the AIGCP is under-represented in the decision-making process pertinent to the sport of professional cycling. The AIGCP has tried to be more influential in pro cycling for a decade, gaining more influence could be a good thing but this is also about money, lots of money. As AIGCP stated in that release, they represent 2000 employees and 321 million euros per year. They want a fair and equal say. Nothing wrong with that I suppose, although it isn't crystal clear to me exactly what the AIGCP want to do when/if they got it. Television revenues are important because the financial possibilities when it comes to attract sponsors has never been so hard. Cycling teams are mostly being run by former riders and it could be difficult to deal with the business aspect of managing a team. After all, there is nothing indicating that being a world class athlete makes you a world class manager. This is known as the Peter principle. Being able to decide more of the structure of the World Tour is something I feel the teams should be able to do. After all, their sponsors are interested in getting their ROI, the team has a certain amount of riders and staff and do not want to travel the world on tights budgets and time schedules. Should teams make money or get their budget in zero? To be able to decide more of the structure of the WT is something I feel the teams should be granted, as well as getting a fair share of the televsion revenues. However, I think the AIGCP could be more open to expressing what their intentions are beyond these matters, as they criticize the UCI for being "secretive" and closed.